Prime Minister Justin Trudeau told a group of Cuban students today that he won't change Canada's stance on Cuba, even though his views are at odds with the man set to lead Canada's biggest trading partner. Canada won't change its decision to maintain diplomatic relations with Cuba, even if that stance is at odds with the man set to lead Canada's biggest trading partner, Prime Minister Justin Trudeau said in Havana on Wednesday. When asked about the U.S. embargo on Cuba, the election of Donald Trump and concerns about the future of Canada-Cuba relations, Trudeau repeatedly tried to calm curious Cuban university students he was addressing. The front row also held an unexpected guest: Cuban President Raul Castro. "For me, election results in the United States won't change the strong relationship that is a friendship and a partnership between Canada and Cuba," Trudeau said. Trudeau said Canada doesn't see a contradiction or issue with being a steadfast and unflinching friend to Cuba and being an ally of the United States. He said the foreign affairs stance is one way Canadians reassure themselves "that we are our own country, that we make our own choices." "We disagree with the approach the United States has taken with Cuba. We think that our approach is much better — of partnership, of collaboration, of engagement," he said. "But it's not our job to tell our friends and allies what they should do or shouldn't do. It's our job to make sure we're doing what we know that we should do, that we can do in terms of creating opportunities for Canadians, for Canadian companies, but also opportunities for Cuba to continue to develop, to modernize, to improve in the many areas that it's building success in." The hour-long session with students at the University of Havana came on the same day the Cuban military began five days of exercises, manoeuvres that were first staged when Ronald Reagan was in the White House, but haven't taken place in the last three years. The exercises were announced by Castro last April. But they're now taking place in the aftermath of Trump's election victory in the United States and his promise to roll back the steps Barack Obama has taken to revive relations with Cuba that were cut off in 1961. At the time, Canada decided to retain ties with Cuba. Trudeau referenced his father's visit to Cuba as prime minister in 1976, the first by a NATO leader, and his own personal forays to Cuba in his remarks to the assembled students, media and Cuban officials. 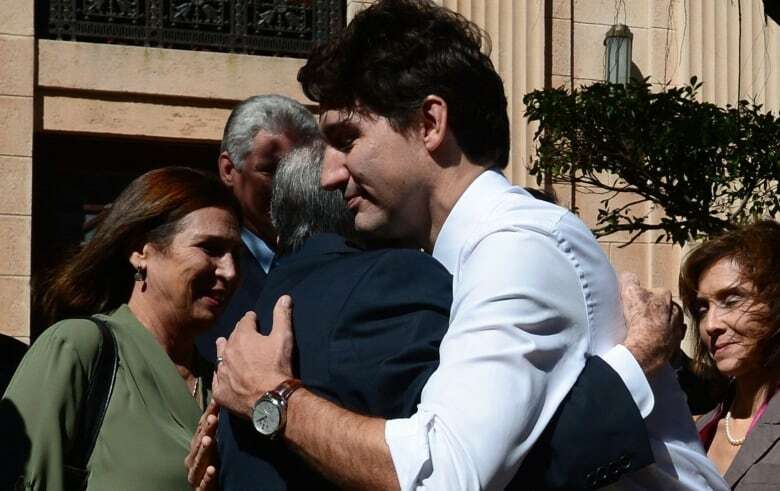 That visit by Pierre Trudeau, remembered by some Cubans, might be helpful for the current prime minister in his bid to open space for Canadians to do business and invest in Cuba, but doesn't provide any direct advantage to Canada, said Mark Entwistle, a former ambassador to Cuba. Canada, he said, has to compete like anyone else in Cuba. 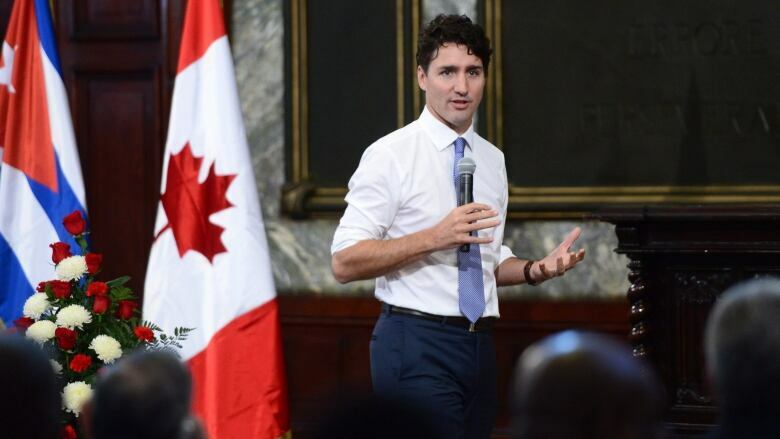 Wednesday's university event came after the prime minister sat down in the morning with eight "civil society" representatives, including a former Cuban diplomat to Canada, a blogger, a leader in the country's Jewish community and a documentary filmmaker critical of state policies. The eight were chosen because they spoke to issues the prime minister has trumpeted at home and abroad, but also because they, as locals say, speak to the unspoken issues in Cuba: homophobia, racism and sexism. Some in the room had faced harassment, or been detained for their public views. Others have advocacy groups that must come under the umbrella of the state in order to be eligible for funding and continue operations. Human Rights Watch in its report on Cuba says the government punishes dissenters with short-term, arbitrary arrests, and discourages public criticism through "beatings, public acts of shaming, and the termination of employment." The group Justin Trudeau met with was different from the dissidents Obama met during his visit to Cuba, after relations were renewed in December 2014. Later in the day, Trudeau told reporters he raised the issue of human rights with Castro during their closed door meetings, but didn't detail the discussions. "When Canada engages with leaders on the world stage, we talk about human rights, we talk about the values that are so important to Canadians and indeed to people around the world," Trudeau said. Entwistle said Cuban and Canadian officials have spoken about human rights in the country over the years, but the tone and choice of words remains important. "If it's a respectful conversation about expectations and about rights and our interests in individual political rights, the Cuban interests in broader social and economic rights, then that's a conversation I think that the Cubans expect to have," he said. There was an expectation that Trudeau would have a private meeting with Fidel Castro while in Cuba, but Trudeau confirmed late in the day that the two did not meet. He did not provide a reason for why a meeting didn't take place. He did, however, meet with three of Castro's sons. The 90-year-old Castro is rarely seen in public. His health usually dictates whether he can meet with visitors on any given day. He was an honorary pallbearer at Pierre Trudeau's funeral in 2000. This Canadian Press story has been amended to clarify that Cuba's military exercises were announced last April, before Donald Trump won the U.S. presidential election. Justin Trudeau heads to Cuba as Trump win clouds relations with U.S.